Headquarters and HQ Company 1287th Military Police was activated April 20, 1943 at Fort Custer, Battle Creek, Michigan per General Orders 15, HQ Fairfield Air Depot Control Area Command, Patterson Field, Fairfield, Ohio. Officer personnel is to be furnished in accordance with letter AGO (AG 320.0 (7-13-42) MR-WDGCT), dated 17 July 1942. Enlisted fillers are to be furnished from various Air Bases in Southern and Southwestern States. 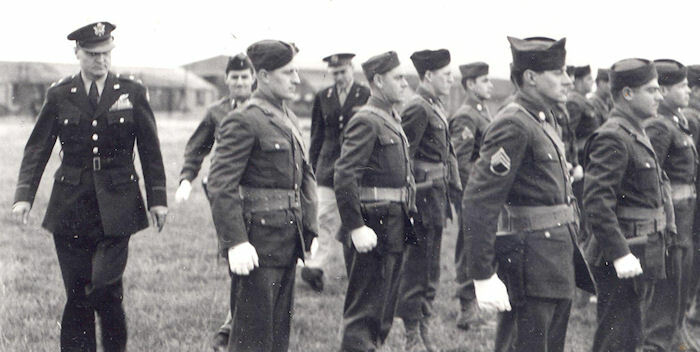 The organization is to complete basic training under the supervision of the Provost Marshal General for a period of ten weeks, after which time the unit is to be ready for functional duty at some other station and will then revert to the control of the Commanding Officer, Fairfield Air Depot Control Area Command, Patterson Field, Fairfield, Ohio. The history of the unit 1287th Military Police Co (Avn) from activation up to Aug 29, 1943, is covered in the history as submitted by the unit Hqs in Shipdham. The following is a summary of Detachment 'A' 1287th M.P. Co's (Avn) history from the time of its arrival at Station 118 through Nov 30, 1944. Detachment 'A' 1287th M.P. Co (Avn) consisted of 2/Lt Peter C. Constance as Detachment Commander and Provost Marshal, and 2/Lt Archie Cagle as his assistant and 52 enlisted men. Duties of various department heads. 1. The Provost Marshall of a Post, Camp or Station is responsible for the safety of that Post, Camp or Station. He has supervision in all military police work, and he is also in charge of administrative affairs connected with police work. 2. The Provost Sergeant is in charge of prisoners; outlines their work program from day to day and looks after the welfare of the prisoners. During the past 16 months, the 1287th MP Co (Avn) has handled approximately 80 prisoners, 29 of whom were later transferred to Disciplinary Training Centers. The Provost Sergeant on this base is in charge of registering bicycles of which there are about 2300, so it may be easily seen that is quite a job in itself. He is responsible to Provost Marshall for safekeeping of prisoners. If a plane crashes, he is responsible for seeing that a guard is placed around it for protection. He is responsible for the whole relief on duty. There are three corporals of the guard and their working time is the same as that of the sergeants. Corporal of the guard is the assistant to the Sergeant of the Guard in that he sees that sentries are properly posted on our seven posts. Sentries on post work 24 hour shifts, but are arranged so that no man works more than 8 hours. 5. Duties of sentries on various posts are somewhat varied as some posts are considered of more importance to the security of the base than others, hence special orders for each post. Each sentry is required to check passes of personnel leaving and returning to the base. He checks trucks for proper trip tickets. He does not allow civilians to enter without proper identification. The sentry is also a fire watch and he is to report immediately, by telephone, any fire that he sees. This man is also a gas sentry and has been especially trained for this work. We have no town patrol, but we do have an outer circle patrol whose duties are to patrol small villages within a radius of 8 miles. These MP's check pubs for disturbances of any sort and to see that men are dressed in proper uniform. We also have a perimeter patrol whose function is to assist plane guards in case of disturbance or fire. This patrol carries the Officer of the Day in his rounds of checking reliefs. The problem of guarding planes on this field is taken over by the plane guard system, the personnel of which are furnished from the four bomb squadrons; each squadron guarding its own planes. All of this is under the jurisdiction of the Military Police who furnish a plane sergeant and a corporal. The main duty of these plane guards is to allow no person regardless of rank, to approach the plane without proper identification. Sometime during the first part of last May, there was instituted what was known as a Station Defense Unit, or X-Force as it was called. This force consisted of about 30 men from the 10th Station Comp. Sq. and 20 x-gunners from the various bomb squadrons who had completed their tour of duty. This force was attached to the 1287th Military Police Co and was set up to function the moment enemy aircraft was spotted. After three months of watchful waiting this X-Force was dissolved, whereupon the alert platoon took its place. These men are available at all times and can be used for disturbances on the outer circle. Since the arrival of Detachment 'A' 1287th Military Police Co. (Avn) 16 months ago, there has been a complete change of officer personnel. 2/Lt Constance was promoted to 1/Lt about one year ago last November and 2/Lt Cagle was promoted to 1/Lt last March. Last May 1/Lt Cagle was transferred off the base and 1/Lt George B. Willis took his place as assistant Provost Marshal and Detachment Supply Officer. In November of this year, Lt Constance was transferred to Shipdham to take over the duties as commanding Officer of 1287th Military Police Company (Avn). Lt Willis assumed Command of Detachment 'A' 1287th Military Police Company and Provost Marshal, 1/Lt Frederick J. Duffy was attached from the 10th Station Complement Squadron on 3 December 1944. He has assumed the duties of Assistant Provost Marshal, Executive Officer, and Detachment Supply Officer. In the past sixteen months our detachment has a net loss of one assigned officer and a net gain of eight enlisted men. January 1944 - The company performed the usual guard duties. Detachment 'A' lost Pvt Swensgard, Pvt Myers & Pvt Chaviers to the Disciplinary Training Center. Additions to the organization were T/Sgt Ruth, PFC Seymour, Pvts Corona, DiGregorio & Mrowion, all from the 806th Chemical Co. at this station. These men had been on special duty with the company for some time, doing an excellent job and they will make welcome additions. February 1944 - There has been no change in the duties of the company. We are still quartered in tents and with few exceptions have managed to keep warm. We have had some nasty windstorms but the tents withstood the heaviest gushes thanks to the expert tent pitching done by the Combat Engineers. Detachment 'A' lost Pvt Garrett to the Disciplinary Training Center. December 1944 - The month of December 1944 was a comparatively quiet month for the military police organization. At the beginning of the month, our assigned personnel consisted of one officer and 61 EM, and 22 attached men. On December 3, 1/Lt Frederick J. Duffy was attached from the 10th Station Complement Squadron. His position with the detachment is that of Assistant Provost Marshal and Executive Officer. Our acting 1st Sergeant, S/Sgt Francis Conti, is an old army man who has had 14 years previous service, and who is soon to be awarded the Bronze Star for long and meritorious service. For the month of December, 73 violations turned into 2nd Bomb Division, these violations falling into three main groups; namely: traffic, out of uniform, and late passes. In the investigation department, stolen vehicles recovered were 2, and there were 5 accidents reported, one of which was fatal although the party was not from this base. In the matter of military courtesy, this station as a whole is showing great improvement and a lot of this is due to the fact that the military police are constantly reminding the station personnel of the importance of military courtesy toward officers. January 1945 - The highlight of interest for the 1287th M.P. Co for the month of January was the sending of four men to the infantry. This reduced our company strength from 60 EM to 56 EM, and of course this may be just the beginning of changes that will take place in the future. 118 violations were turned in on this station for the month of January, and of this number, 28 were forwarded on to division for further action. We had a net loss of 2 prisoners from the guard house. All prisoners are of course garrison prisoners. In the investigation department, there were four auto accidents reported, two thefts reported, and one accidental shooting-the victim accidentally shooting himself. There was one unauthorized use of government vehicle and three private guns were registered. In the bicycle department, approximately 250 bicycles were registered. Military courtesy on this station is improving steadily, and a great deal of credit should be given to the MPs for their constant vigilance and foresight in seeing that military manners are carried out. February 1945 - The 1287th Military Police Company, Detachment 'A' began the month of February with a company strength of 56 EM but by the 15 February we had lost 12 assigned men to the 1261st MP Co leaving a total of 44 EM. With our strength cut down, we had to cut reliefs from 5 to 4 in order to function properly. For the month of February, there were 50 miscellaneous violations turned in from this station with the majority consisting of being late on pass, no rear light on bicycle, no registration card, and one violation for drunkenness. At the end of the month, there were 5 garrison prisoners in the guardhouse. In the investigation department, there was one case of theft on the station, one off the station, one case of theft and assault, one assault case, and 2 auto accidents. The bicycle department had another good month with the registering of 240 bicycles. 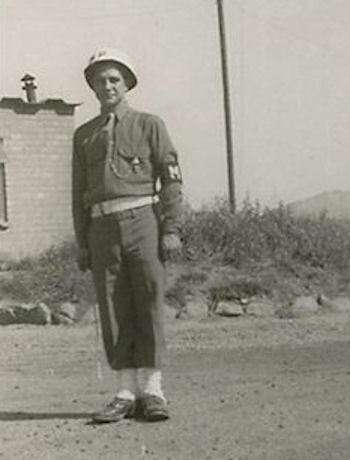 March 1945 - The 1287th Military Police Company, Detachment 'A' started the month of March with 44 EM and 18 attached men, and by the end of the month had our 44 assigned men but had lost 4 attached men. The big excitement for this field was on a Saturday night of 4th of March when German planes strafed the runway which resulted in a great deal of damage to the runways and the ruining of seven planes. Luckily, no lives were lost. Station 118 is to be congratulated for having a near negative report for the month of March, in that there were no arrests, no accidents and only one case of robbery which came under the investigation department. Garrison prisoners in the guard house dropped from 4 at the end of February to 2 at the end of March, and these are trustees. Bicycle registrations dropped from 240 in February to around 150 for March. Detachment 'A' April 1945 - Here it is the middle of the month of April and not much has happened in the way of excitement, only the usual MP duties and so forth, as for violations there has been a slight decline in the submission of some-those that did get it were for the usual minor things such as violations of uniforms and such, around 20 in all up to the writing of this chapter. In the way of investigations, so far, there has only been one that amounted to investigation, and that one is still being investigated, as to the outcome it seems very vague, but we have our best man in S/Sgt Vendetti on the job. The 15th of April which is today-is a very important date for this company-as is the saying that everything comes to an end sooner or later, but in this case this day marks the end of this wonderful organization which was always on the ball. It marks the date of 15 April 1945, as the day of deactivation of this Detachment which we are so sorry to see it go, nevertheless we are enlightened by the fact that we now are part of a larger organization in the Air Corps, this being the 405 Hqtrs & Base Service Sq, ASG, at this same station, of course several of our good men have been transferred-this being S/Sgt Armand and T/5 Buffalo to the 829th Eng. (Avn), but we shall not lose tract of them as they remain on the same station. Our CO has also been transferred into the same outfit, for which we are glad and also remains as our Section Officer and guess everything will run to perfection as Lt. Willis knows how things are to be run. Everybody in the Old Detachment will hold the same job, more or less, and the only thing new will be that we have a new C.O. in Capt. Dawson, and a new 1st Sgt which we know both will be alright. Attached to this finds a list (roster) of men who were with the detachment at time of deactivation. MPs standing inspection.The inspectors could be Lt Willis and Sgt Ramsburg. 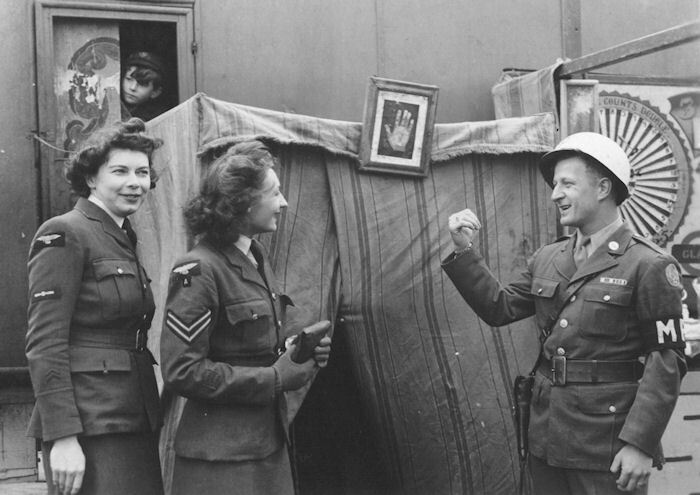 An MP greets WAAFs coming to the 392nd's 100th mission party on 20 June 1944. This photo of a uniformed MP shows why they were nicknamed "Snowdrops" by British civilians. 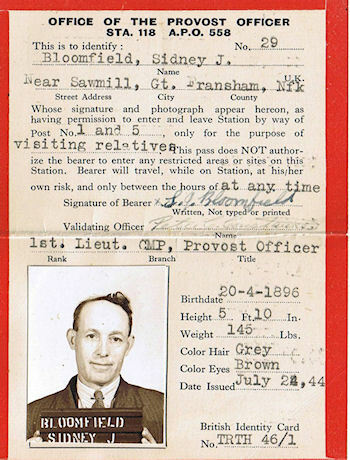 British civilian Sidney Bloomfield had to show this pass to the MPs whenever he visited his parents, as their house was within the base perimeter. It was signed by then-Provost Marshall 1/Lt Peter C. Constance.